On this subject, 4 refereed papers are written in Japanese. On this subject, 23 refereed papers are written in Japanese. On this subject, 35 refereed papers are written in Japanese. On this subject, 7 refereed papers are written in Japanese. Gotoh, H., Shao, S. & Memita, T.:SPH-LES Model for Wave Dissipation using a Curtain Wall, Annual Jour. of Hydraulic Eng., JSCE, Vol. 47, pp.397-402, 2003. On this subject, 8 refereed papers are written in Japanese. On this subject, 17 refereed papers are written in Japanese. On this subject, 21 refereed papers are written in Japanese. On this subject, 38 refereed papers are written in Japanese. On this subject, 10 refereed papers are written in Japanese. On this subject, 5 refereed papers are written in Japanese. On this subject, 18 refereed papers are written in Japanese. H. Gotoh, A. Okayasu and Y. Watanabe: Computational Wave Dynamics, World Scientific Publishing Co., 234pp, 2013. Hitoshi Gotoh: Computational Mechanics of Sediment Transport, Morikita Shuppan Co., Ltd., 223pp, 2004 (in Japanese). Goth, H.：Numerical Wave Flume for Simulating Flows with Violent Free-Surface Motion, The 11th International Workshop on Coastal Disaster Prevention, 2013.4. In domestic conferences and symposiums, 14 invited lectures were provided by Hitoshi Gotoh. Ikari, H., Gotoh, H., & Khayyer, A.: Numerical simulation on moored floating body in wave by improved MPS method, Proc. Coastal Structures 2011, Yokohama, on CD-ROM, 2011. Khayyer, A., Gotoh, H., Ikari, H. and Hori, C.: Development of 3D Parallelized CMPS-HS with a Dynamic Domain Decomposition Approach, Proc. International Session in Conf. on Coast Eng., Vol.1, JSCE, pp. 6-10, 2010. Gotoh, H., Ikari, H. and Yoshifuji, N.: 3D Numerical Wave Flume with Interactive Pre-and Post-Processors, Proc. International Session in Conf. on Coast Eng., Vol.1, JSCE, pp. 71-75, 2010. Khayyer, A., Gotoh, H., and Shao, S.: Corrected SPH for Incompressible fluid for accurate water-surface tracking in plunging breaker, Proc. ICCE, Hamburg, Germany, pp. pp.132-143, 2008. On this subject, 2 refereed papers are written in Japanese. Sakai, T., Harada, E. and Gotoh, H.: 3D Lagrangian simulation of compaction process of wave dissipating blocks due to high waves, Proc. ICCE, Hamburg, Germany, pp.3412-3422, 2008. On this subject, 6 refereed papers are written in Japanese. Note: A sedimentation process of wave dissipating blocks was reproduced by LES with high-resolution solid-liquid two-phase flow model. 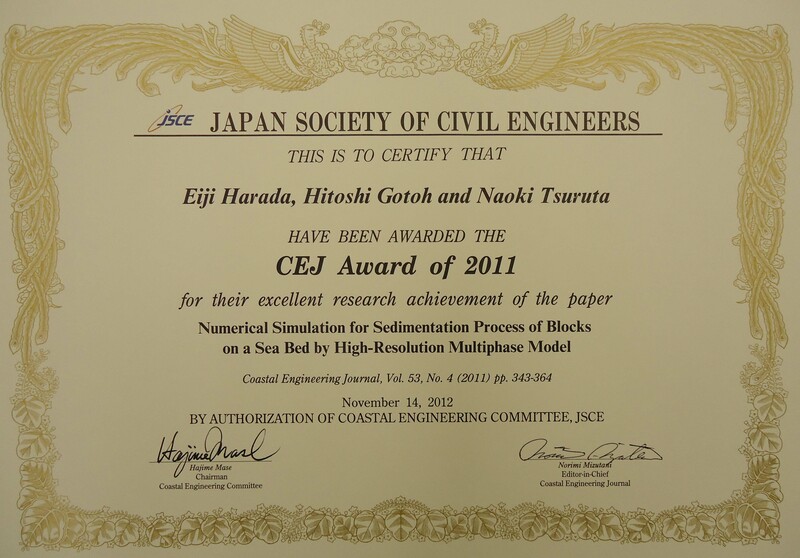 This paper was selected as the best paper among papers published on the CEJ in 2011. 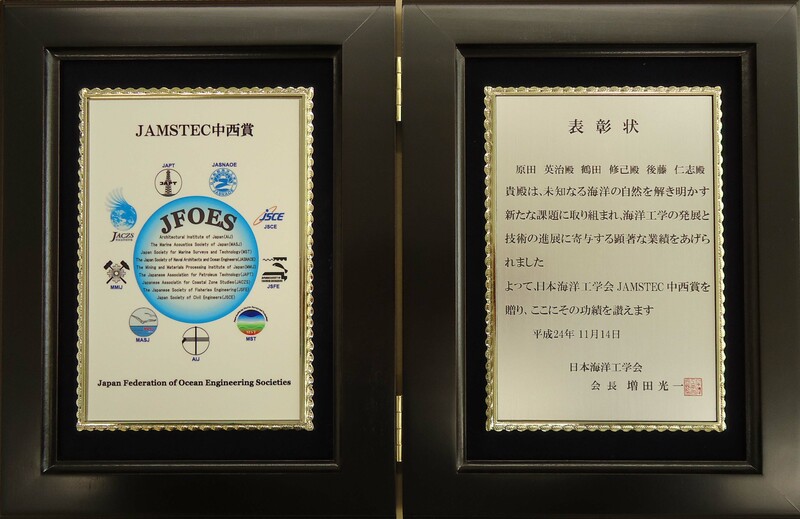 Note: Winners worked on a new problem about unknown marine nature and achieved remarkable results on development of the ocean engineering and related technical issues. Note: A vertical grading mechanism of the sheet-flow sediment transport was clarified by an experimental visualization and a numerical simulation by the granular material model based on the distinct element method. 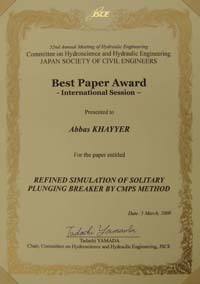 This paper was selected as the best paper among papers published on the CEJ in 2008. Note: Analysis of plunging breaker by accurate MPS method (Co-author: Hitoshi Gotoh). 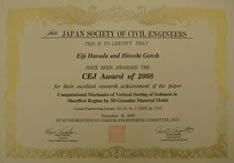 Incentive Prize in Journal of JSCE (Japan Society of Civil Engineers), 2007. Note: Computational mechanics of coastal sediment grading by Numerical Movable Bed (Co-author: Hitoshi Gotoh). Note: Clarification of the superiority of particle methods in reproduction of wave overtopping discharge to conventional numerical models. 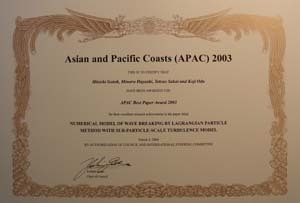 This paper was selected as the best paper among papers published on the CEJ in 2004. 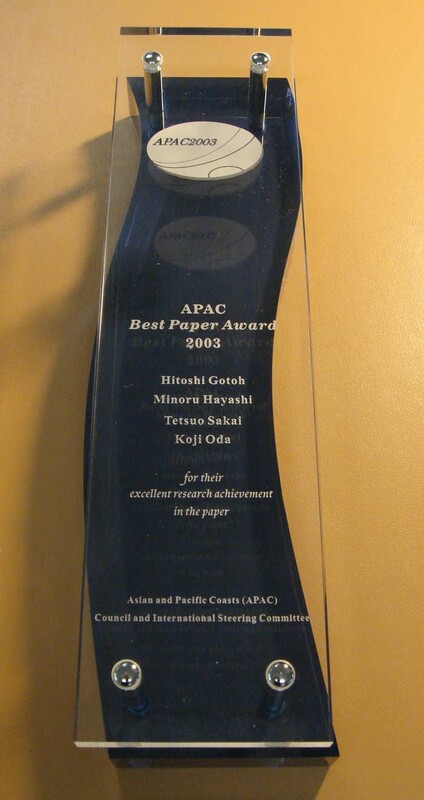 APAC Best Paper Award of 2003, 2004. Note: Development of SPS turbulence model for a high-Reynolds number computation of particle methods and its application to a wave breaking. 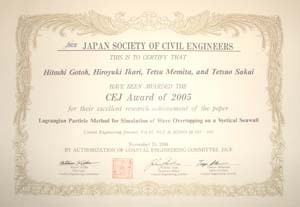 Incentive Prize in Journal of JSCE (Japan Society of Civil Engineers), 1993. Incentive Prize in Journal of Hydraulic Engineering (Committee of Hydraulic Engineering JSCE), 1993.